CES is a great place to see technologies of all kinds, but often times those new technologies and startups get buried under all the other mainstream tech news. HoloLamp is probably one of those technologies that hasn’t gotten much press coverage. HoloLamp is still a start-up company trying to find its way into the marketplace and is basically a concept. The company is making a holographic lamp that can project holographic images into your world. Basically, this is a form of augmented reality and the founder modeled his first efforts to the classic Star Wars game Dejarik. HoloLamp is a desktop, glasses-free, spatial augmented reality system for gaming, holographic communication, education and much much more. The company is planning on launching a crowd-funding campaign in the first quarter of 2017 and they have a developer pack available for Windows 10 and MacOS. The technology is still in its very early stages and, as with any technology, there is no guarantee that will work. The idea is brilliant and just seeing what they’ve managed to come up with is already impressive, but it’s investors and supporters that need to be impressed. While I can’t think of the myriad of uses for such a device, I am sure there are more uses than just playing Dejarik. Current Augmented Reality (AR) solutions are based on looking through systems be those glasses/phones/tablets or other devices they mix reality with the augmentation but fail in so many ways. Glasses based ones reduce the field of view (and sometimes are uncomfortable), while viewing through a phone or other device places the screen at arms length and makes the interaction less immersive and your hands are being used to hold the screen. However, there is a branch of Augmented Reality that copes with these issues, Spatial Augmented Reality delivers a glasses-free and hands-free Augmented Reality experience using the way our eyes perceive 3D objects to allow you to perceive a 3D experience. The systems do this by tracking the users eyes and projecting the image they would expect to see if it was a 3D object. There are numerous works of art that play on the way our eyes perceive flat projections of 3D objects and make them come to live. Spatial Augmented reality does this with moving images on any surface by mapping the surface and tracking the user the image projected is warped so that from the users point of view it is what they would expect to see as a 3D holographic effect. A number of research labs have been working on this for fixed installations using complex fixed projector setups but the demos are still at the research stage. HoloLamp is a desktop version of this Spatial Augmented Reality projection system combining a pico projector and cameras when attached to a computer and using a 3D environment created in Unity the user can experience a hands and glasses-free spatial augmented reality experience. It uses computer vision and machine learning to optimise the effect as you watch the game or interact with your lego mini-figs. HoloLamp.io have a number of demo videos showing some of the ideas that are currently being worked on but any environment where seeing and interacting with a 3D model could be a candidate for this type of environment. The HoloLamp project is focusing on three areas of applications, video games, education and communications. 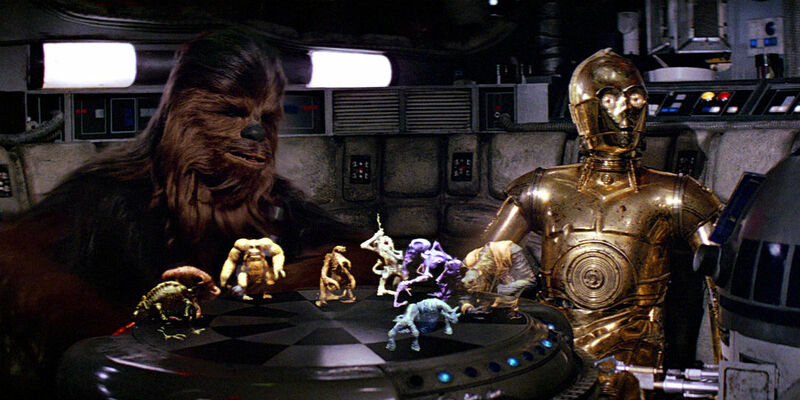 The demos available already include an animated chess game that is inspired by the games played in Harry Potter and Star Wars. The videos HoloLamp has produced are pretty fun — who wouldn’t want to play with their Star Wars Lego’s in an augmented holographic reality? We’re going to try and keep an eye on HoloLamp to see where they go in 2017 and if the technology can make it to market. If it isn’t this company, I’m sure someone will eventually bring this tech into reality and to consumers. What do you think of HoloLamp? Let us know your thoughts and comments below or on Twitter, Facebook, and Google+.